I’ve played the role of King Duncan, the noble patriarch foully murdered in his sleep with poison in his ear and a dagger across his throat. His brave and resourceful young son Malcolm vows revenge and leads a conveniently agreeable English army into battle to regain his rightful throne. In my previous post I examined the true Macbeth and Lady Macbeth who were transformed into the ‘evil monsters’ of the Scottish play. Now I’d like to shine the light of history on Macbeth’s predecessor and successor on the Scottish throne of the 11th century. They’re not quite the men Will told us about. King Duncan. The son of Bethoc, who was the daughter of King Malcolm II of Scotland, Duncan was actually cousin to Macbeth. Macbeth’s mother was Malcolm II’s younger daughter Donada. Duncan was a far less competent ruler than his grandfather. He ascended the throne in 1034 when he was probably no more than thirty years old. While he had military ambitions, he dithered while England was in turmoil after the death of King Canute. Thus he missed whatever chance he had of taking advantage of the argument over succession there. He bungled attempts to invade Northumbria to the south and Caithness to the north before turning his attentions even further north. He set out to battle another of his cousins – Thorfinn, the Earl of Orkney. It didn’t go well. Back on the Scottish mainland in retreat from Orkney, Duncan and his army literally ran into that of Thorfinn’s ally Macbeth. Duncan was killed in battle at Pitgaveny on 15 August 1040. The story of his being murdered in his sleep is a total fiction. He was a ruthless but incapable king whose death was not widely mourned, despite his self-appointed title of ‘Duncan the Gracious’. Malcolm. When his father Duncan was killed in battle in 1040, eight- or nine-year-old Malcolm was whisked away to be raised in the court of the English king Edward the Confessor (‘pious Edward’). In 1054 Siward, Earl of Northumbria, was ordered by King Edward to invade Scotland in support of young Malcolm. The following year Siward’s and Macbeth’s armies battled at Dunsinane in Perthshire. Macbeth was defeated but escaped the battlefield to return north to Ross. Malcolm sat on a throne that was recognised by the English but not the Scots. That recognition didn’t come until after the deaths of Macbeth in 1057 and Lulach in 1058, at which point his legitimate place in the line of succession was recognised by the council of thanes and he became Malcolm III of Scotland. He’s described as “a swaggering bully who rapidly earned himself the nickname of Malcolm Canmore, or Malcolm the Bighead”. Malcolm Canmore proved to be a treacherous ingrate. No sooner was he recognised as king, than he began making raids into Northumbria and pillaging Siward’s lands. He even violated the long-standing and revered Peace of St. Cuthbert in Holy Island. By 1066 Malcolm had allied himself with the Norwegians who were supporting a revolt against the English (Saxon) king Harold, who had succeeded Edward. The revolt was led by Harold’s brother. The third warring faction of 1066 were the Normans under William. Both Harold and William had actively supported Malcolm at different times, and neither was pleased to find him now allied with their common enemy. Malcolm III remained a persistent irritant to William, making and breaking alliances and mounting small fleeting raids south. Both Malcolm and his eldest son Edward were slain in a battle on the Alne on 13 November 1093, after an ignoble reign of thirty-six years. Shakespeare’s depiction of who were the heroes and who were the villains in the Scottish court is warped, whether by design or convenience or insufficient knowledge. It’s said that history is written by the survivors, or by the victors. What’s been written by a playwright half a millennium after the fact isn’t history at all. It’s still a bloody good story, mind you. In the early 1600’s Shakespeare won the favour of his new King James I by recasting Scottish history to give his monarch the stamp of divine authority as the latest in a glorious line of prophesied rulers. But in doing so the Bard rewrote the record books, drastically changing the natures and histories of his key characters. It’s impossible for us to know now what research Shakespeare did. What sources were available to him, writing in London about events in the north of Scotland nearly six hundred years earlier? How much attention did he pay to those sources anyway, given his primary objective of pleasing the former James VI of Scotland, descendant of the 14th century Banquo? Whether by design or genuine ignorance, he left us with literary figures massively different to their historical counterparts. Here are the true stories of two. Next post, I’ll introduce you to more. Macbeth. Born in 1005, Macbeth was by birth the Thane of Ross. As Malcolm II’s grandson he had a legitimate claim to the throne, a claim strengthened by his marriage to the grand-daughter of the previous king, Kenneth IV. With that marriage he also became Thane of Moray until his stepson Lulach would come of age to take on that title. When Duncan died in battle in 1040, Macbeth was correctly next in line for the throne. He was formally elected to the kingship by Scotland’s council of thanes “without contest or opposition”. Macbeth was described as “a tall man with ruddy complexion and fair hair.” He ruled strongly and wisely for fourteen years without major mishap. He was regarded as a generous and pious ruler, undertaking a pilgrimage to Rome in 1050 and “giving kindly” to the poor both at home and along the way. He was the first king of Scotland whose name appears in the ecclesiastical records as a benefactor of the church. In 1055 he was defeated in battle at Dunsinane by the army of Siward, Earl of Northumbria. He managed to escape the battlefield after what official records of the time called “many displays of courage”. Unfortunately we’ve got no details beyond the estimate that three thousand Scots and fifteen hundred Englishmen died during the battle! Siward returned to Northumbria, while Macbeth went north to his ancestral lands. Despite the defeat, Macbeth remained king of Scotland, albeit harried by Duncan’s son the pretender Malcolm, who was ‘recognised’ as king by the English court but not his own people. Macbeth was killed in August 1057 at Lumphanen, either by Malcolm or one of his personal guards. Macbeth’s stepson Lulach, by then 25 and Thane of Moray, ascended the throne. Lulach in turn was killed in battle at Essie in March 1058. His body was interred along with that of Macbeth at Iona on the island of Mull. This was for many centuries the common sepulcher of the Scottish kings. Lady Macbeth. Lady Gruoch (to give her correct name) was the daughter of Boedhe, son of King Kenneth IV of Scotland. First married to Gilcomgain, the Thane of Moray, she bore his son Lulach. Gilcomgain died shortly after Lulach’s birth. Some time later Lady Gruoch remarried, this time to Macbeth, Thane of Ross. Thus the Moray title passed to her new husband until her son achieved his adulthood. It seems very likely that Macbeth’s description as “the friend of the poor and benefactor of the monks” owes more than a bit to Lady Gruoch’s influence. She was quite a wealthy woman in her own right, especially after Gilcomgain’s death. It’s known that she donated part of her own lands at Moray to the Church for the construction of an abbey and other shelter and facilities for the monks. I find myself wondering if the well-known ‘curse of the Scottish play’ actually has anything to do with the outraged shade or shades of the real Macbeth and/or his wife being rightfully upset at the besmirching of their good names and reputations. Perhaps the wrath of a woman scorned really can extend over the centuries! Next time – Shakespeare’s other Scottish kings. I’ve had quite a bit to do with Shakespeare’s Scottish Play over the years. I’ve played various roles in various incarnations of the play: conventional, broad comedy, film and even a rock opera version. What intrigues me most, though, is the real history behind the play. It was, in effect, the political cartoon of its day. The crowd watching at The Globe, especially the mob we’d now call the Great Unwashed, could barely read, if at all. The theatre was the chance for common folk to laugh at posh people, and for the writer and performers maybe the chance to inform and even influence. When Macbeth was written, James I had just taken the throne of England. The former James VI of Scotland was a largely unknown quantity in his new realm, but his patronage was vitally important to the running of the theatre. The real Macbeth lived and died in the first half of the 11th century. That’s six hundred-odd years before the bard wrote the play, which was four hundred-odd years before I was treading the boards. So Shakespeare’s distance from the historical figures was considerably greater than ours is from him. We know a lot less fact about Shakespeare, James and the early 1600’s than we think, although rumour, legend and theory fill in a lot of gaps. It’s hard to know just what research the playwright could or did do about the events of the 1040’s and 1050’s. But William’s main aim wasn’t historical accuracy. The main aim was endorsing the rule of the new king (and flattering him at the same time was a diplomatic idea). 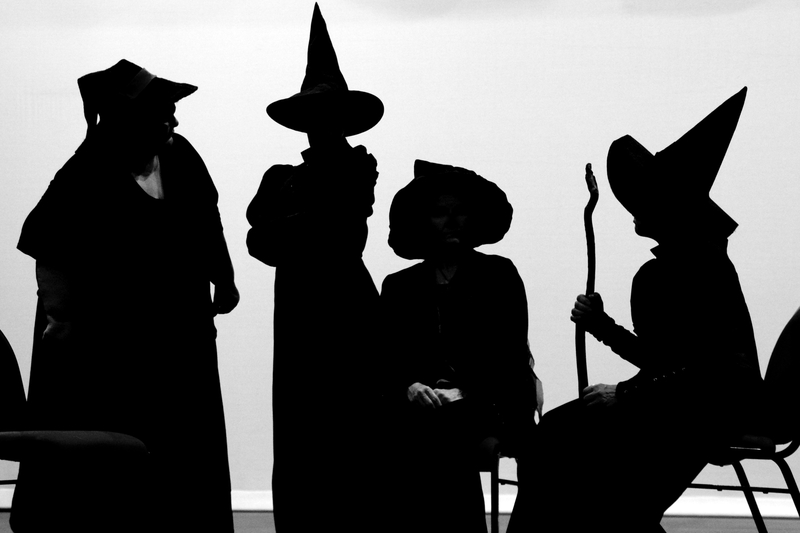 The very first scene of the play – the three witches on the blasted heath – had dialogue drawn from a book written by James himself on the history and practice of witchcraft. There’s a good way to stroke the new boss’s ego – the first words he hears on stage are ones he wrote himself! There’s a story that I love but have never been able to confirm. Do you remember the scene where the murdering monarch is confronted by a succession of ghostly crowned figures: the descendants of Banquo? According to obscure legend, when Macbeth was first performed the last of those apparitions was played by James himself, wearing his own crown. For the audience, here was their new ruler getting the Big Tick that he was the Rightful King, with generations of history behind him. The depiction of Banquo is an excellent example of the playwright turning history on its head (or inside out) to suit his own ends. Banquo really existed, but hundreds of years after Macbeth and a similar period before Shakespeare. He held the hereditary position of Thane of Lochaber around 1350. The Stuart bloodline begins as a Royal Family in Scotland some generations later when a childless king bequeathed his throne to his eminently capable (and thus widely acceptable) steward, the Thane of Lochaber. So Banquo was never king, but he begat them – just like in the prophecy. Not enough is known of the original 14th century Banquo to be sure if the playwright was being accurate, generous or terribly misleading in his construction of the character. Unfortunately we do know that, in playing fast and loose with history in order to make his new king happy Shakespeare left us with some very distorted views of Scottish royalty of the 11th century. There are some records of the time, and with the technology we have it’s probably easier for me to unearth the real stories than it would have been for Stratford-on-Avon’s most famous son. Next post, I’ll try to set the record straight for you and talk about the historical figures behind the characters! I wonder: how much to read while I’m writing? I find I’m torn when I’m in the process of writing (and that’s most of the time). I love to read other writers’ work, especially though not exclusively fantasy. I’ve gotten past the whole “Oh, I’ll never be as good as this” self-doubt thing, realising that we’re all different with different things to offer. But I do worry that I’ll find myself channelling or copying their style or content, consciously or otherwise. I’m curious to hear others thoughts? Thanks! MY PURPOSE AS A WRITER IS TO GIVE EXPRESSION TO ALL OF THE STORIES IN MY HEAD. AS I WRITE THEM, MORE APPEAR. I WILL ENTERTAIN READERS AND MAKE THEM THINK ABOUT THEIR POTENTIAL, THEIR RELATIONSHIPS AND ATTITUDES. I WILL RESEARCH BY TRAVELLING, READING AND LISTENING. I WILL INSPIRE OTHERS TO EMBRACE, EXPLORE AND EXPRESS THEIR OWN IMAGINATIONS. Our three month sojourn in and around Hervey Bay is over. My spell as guest director and writer for the Maryborough Players has ended with the same fun and camaraderie that has typified it from the outset. My thanks must go to Sir Terry Pratchett, for graciously giving me permission to adapt his wonderful novels for the stage. “Witches Abroad” was the latest, and brought with it an interesting range of challenges. First and foremost of these, as Discworld readers might expect, was deciding which elements of the novel to keep and which to reluctantly leave on the ‘cutting room floor’. It’s a process I’ve endured before, and for those who are interested in how I approach it I intend to soon start posting elements of my workshop “Playwright: Write! Right?”. That will give you some insights into how I work – if they strike a chord for you I’ll be well pleased. Some of the physical requirements of putting “Witches Abroad” on stage were a little daunting, but I’ve had two key things in my favour: the excellent facilities of Maryborough’s Brolga Theatre, and my Technical Manager Rob Haigh. Rob’s ability and imagination helped to bring to life moments such as the Duc’s transformation back into a frog, and the moment when a tornado drops a farmhouse onto Nanny Ogg! All of the cast have brought wonderful depth to their characters in sound, movement and interaction. There’s been exemplary support from the crew – led by rookie Stage Manager Jayne Cronau. Jayne rather landed in the deep end late in the rehearsal period, and it’s been a pleasure to watch how well she’s risen to the challenge of calling a three-hour show with hundreds of cues, keeping her calm and dignity intact! I’ll miss the people. I’ll miss the peace and quiet (and birdlife) of Toogoom Beach which has proved a great place to draw breath and rebalance. I’ll miss being a part of the Discworld, but I’ll be back. I have some projects of my own to focus on for a while – you’ll see them here – but the honour of working with the words of a man of such talent is not something I take lightly. And I’ll be back to The Bay too. (Probably not in summer months if I can help it!) There are too many good people, and good things here for us not to return.